We are now safe back to Sweden again after a fantastic tour. So thank you very much for your contribution, the tour planning (and also replanning during the tour) and your birdguiding was very appreciated from all of us. Thanks again for your expertise and for sharing your fund of knowledge! …I felt I was still in Ecuador several days after touch down on Swedish soil. Couldn't go to sleep, not tired at all. Don't know if it was due to the fact that I slept extraordinary well on the plane back home or - more likely - because of the extraordinary enjoyable bird trip I had just been a part of. Thanks again! We will thank you for a very good birdingtrip in Ecuador.Our birdlist now include 952 species. Wow! It is a pleasure to thank you for the tour, it was very enjoyable to us both. It was very special to meet the birds and plants of the Mindo area with your help. We appreciated your knowledge in every matter - it enriched us very much. The tour was a highlight of trip. If I have another chance to visit in the area I will be very glad to enjoy your company and knowledge again. Many thanks for a wonderfully organized trip that showed us so many different habitats in Ecuador, and so so many birds! I continue to be impressed with your skills and patience to show every person new birds. Thank you very much indeed for a wonderful tour down the east slope. We all very much enjoyed your company as well as your formidable identification skills. 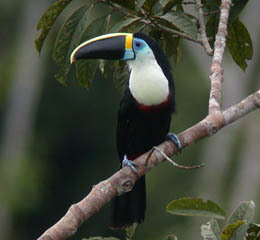 It is so exciting to see birds, to watch you find them and to hear you talk about nature in the tropics. Joanie and I thoroughly enjoyed our trip. Wow, Charlie, and thank you for all this great info! You've been busy since our departure. thank you for a marvelous time -- all the terrific birding and botanizing, all the great general conversation and neotropical education, all the plain FUN. Many, many priceless additions to my memory bank. Charlie, thanks to you for such a wonderful time ...your knowledge of flora as well as fauna is outstanding! Wow, what a trip. Ecuador is simply the most fascinating place to go birding - and Charlie Vogt is absolutely the best birding guide possible. Moss-backed, Blue-and-Yellow & Glistening-green Tanagers today! Plus many other great birds. ...much thanks to Charlie. Thanks for everything. ...you planned a great two weeks on the road, with the visit to Antisana being the icing on the cake. The birding and wildlife watching was great, you certainly know the birds and where to find them! Just wanted to say thanks again thanks for all your hard work and efforts in finding some great birds on our trips. Excellent. Other than our delayed flight into Ecuador everything went beautifully.Roger Ahlman did an unreservedly exceptional job: amazing birding and people skills, helpfulness, patience, perseverance, humor, indefatigability. a HUGE thank you for so patiently and expertly arranging our trip and guiding us with your encyclopaedic knowledge of all the flora and fauna, especially the BIRDS, and helping us to understand so many facets of Ecuador as a country and of Ecuadorian life. You were an amazing guide. I have come back with marvellous memories. Thank you so many many times for the wonderful trip you organized and orchestrated for us. I can't believe the sights we saw, the variety of habitats and inhabitants, floral and faunal. And you taught us so much about their interdependence and co-evolution. Fascinating. I can understand your attachment to your adopted country and your profession. I wanted to thank you again for the wonderful adventure and great company! I have been thinking about the weeks events and candidly the day spent with you was definitely a major highlight and most memorable. I will most assuredly recommend you highly to my brother who will be visiting the Galapagos early next year. Again, I wanted to thank you for a wonderful time. We arrange Custom tours to meet your needs! 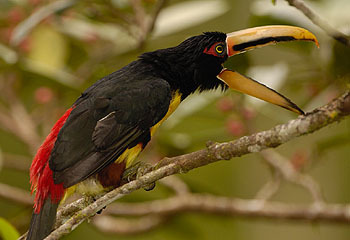 Andean Birding is a birdwatching tour company providing top bird guides, customized itineraries and logistics for your visit to the Andes, Amazon and Galapagos in Ecuador, as well as Peru, Bolivia, Argentina and Mexico. 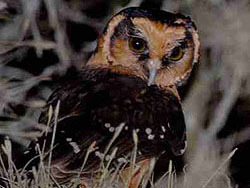 In addition, we conduct bird conservation and ornithological research. Andean Birding is based in Quito, Ecuador; a spectacular country with a birdlist of 1676 (including Galapagos) and has the highest concentration of bird species in the world. See the Hummingbird Webcam Now with sound! 16 days in Tumbesian Heaven. Southern Ecuador is an outstanding destination for its bountiful endemics nestled in a spectacular landscape. This tour visits 8 endemic bird areas with an excellent chance of seeing over 100 endemics, over 50 of them in Tumbesia alone, the richest Endemic Bird Area in the world. With the inclusion of the temperate and elfin forests of Cajanuma and Tapichalaca and the verdant foothills of Buenaventura and Bombuscaro, our birdlist is unbeatable! Join us on our most popular itinerary which spans both East and West slopes for an unparalleled bird bonanza. We have also arranged lodging to minimize drive time and hotel hopping. This tour visits productive and exemplary reserves of 3 endemic bird areas, Chocó, Interandean and East Slope Andes with a chance at 80 endemics! by my friends Dušan Brinkhuizen, Tuomas Seimola, Mitch Lysinger and Rudy Gelis. 425 species vs. previous LSU record of 354! They started in amazonia and east slope then flying Quito to Salinas and getting waders and waterfowl on the coast at night. Highlights from Barry Mantell and Friends tour to Sacha Lodge and East and West Slope Ecuador. Harpy Eagle subadult display flight and perched for 30 minutes near Canopy Walkway, also Ash-throated Crake Sacha Lodge . Black-and-white Hawk-Eagle and 2nd record of Crowned Slaty Flycatcher at Wildsumaco Lodge. Brown Wood-Rail Rio Palenque (no recent records). Tanager Finch pair showing off and Peregrine Falcon at Bellavista Cloud Forest Lodge. Fruiting tree at Mashpi with Black Solitaire, Scaled Fruiteater and Orange-breasted Fruiteater. North Peru 28 Jan- 24 Feb 2014 guided by Roger Ahlman for Zoothera.